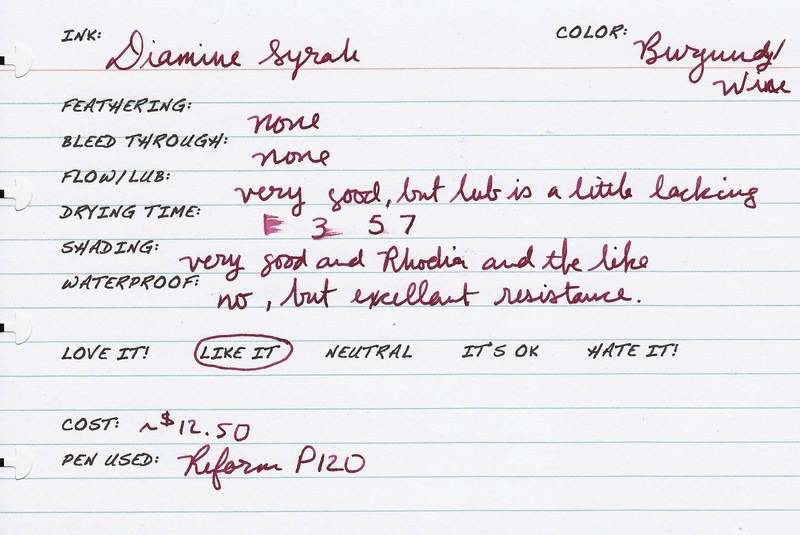 In my review of Parker Penman Ruby I mentioned that I thought its closest current production ink was Diamine Syrah. Now, I thought I had already posted my review of this ink, but apparently I did not. Well, better late than never! Here it is. Diamine Syrah has got to be one of my absolute favorite Diamine inks. This ink is apparently based on Richard Binder’s “Binder Burgundy”. I don’t know if Syrah is a true representation of that ink, but either way it is truly fantastic. I’d describe this ink as an exceptionally gorgeous “glass of burgundy wine” sort of color. It is very close to the color of Parker Penman Ruby. Syrah is just a bit deeper, and it doesn’t shade as well as Penman Ruby. Not waterproof, but it shows some water resistance.